GONE, BABY, GONE was a surprise. Who could have foreseen that washed-up screen actor, Ben Affleck, could’ve directed a movie with such assurance and heft – capturing not only the tension of a crime-drama but also the particularity of a neighbourhood. By contrast, THE TOWN is a disappointment. It’s a solid crime thriller but nothing more than that – and given the acting heavyweights on screen, it should’ve been far better. The plot is straight out of the conventions of the genre. Doug (Ben Affleck) is a bank-robber, based out of Charlestown, Boston. As in all good crime thrillers, Doug is conflicted about what he does, feels bad about terrorizing a hostage, and is doing that “one last job” that we know is going to go horribly wrong. Also true to genre, Doug has a side-kick called Jem (Jeremy Renner) who is a bit of a nutcase (Joe Pesci – anyone?) and takes too many risks. It’s because of Jem’s instability that the robbers end up taking the hostage in the first heist, and cross the line into murdering cops and bystanders. Also by convention, Doug’s loyalty to Jem means that he will go through with that One Last Job despite his better instincts. And, of course, Doug has a girlfriend, from whom he is hiding his true nature. In this case, she is the hostage he was sent to stake out. The script does a disservice to its minor characters, and the high-powered actors wasted in those roles. Chris Cooper plays Doug’s father in a wasted cameo; Pete Postlethwaite plays the local crime boss in another wasted cameo, and John Hamm shows none of the subtlety that makes Mad Men so great, in his role as the FBI investigator. The worst used is Blake Lively, of Gossip Girl fame, presumably cast to draw in the teen-girl crowd, and given little to do but trigger the final betrayal. At least she makes a stab at an authentic accent though. Jeremy Renner doesn’t bother and Ben Affleck fluctuates in how broad he takes his accent. And this works against what should’ve been Affleck’s greatest strength – his ability to depict the neighbourhood and the society that spawns these robbers. Compare Affleck’s portrayal of Charlestown with Debra Granik’s portrayal of the Ozarks in WINTER'S BONE, and you’ll see just how far short he has fallen. 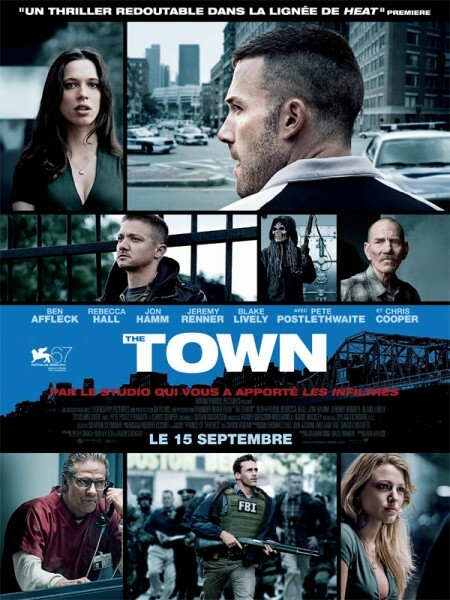 THE TOWN played Venice and Toronto 2010 and is currently on release in the US, Canada, Germany, Austria, the UK, Belgium and Malaysia. It opens later this month in Australia, Portugal, India, Greece, Hungary, the Netherlands, Singapore, Brazil and Iceland. It opens in December in Russia, Finland and Poland. I was also unimpressed by this movie. The laundromat "meeting" between Affleck and Hall's characters and their inevitable ensuing romance wasn't believable at all. If that had worked, then maybe the film would have worked, but as it is, it ended up being the usual cops and robber stuff. Bank robbers blasting machines guns in city streets seemed to have been done as best as it ever will be by Michael Mann in Heat. So when I was watching the scenes in The Town it all seemed to pale in comparison. Never seen Gossip Girl or anything else she's been in, but I must admit this Blake Lively lass surprised me. I'll admit to some pretty blonde girl negative stereotyping here because her being able to act was unexpected. And, as you say Bina007, she seemed to be the only one who was really trying. Good for her, I suppose. Oh, and poor Jon Hamm ... being an avid viewer of Mad Men, we know he can act if required. His character wasn't from Boston, apparently, because he made no attempt at the accent as nearly as I could tell. Either that or Hamm just thought, Sod it, no one will care anyway!